You never know how your hair is going to be. It can be beautiful at one moment and messy the other. Everyone wants to have a soft and soothing hair, but we all know that people also have dry hair or dandruff, as well as many other hair problems that can be very annoying. You may try using some shampoo and your hair will seem that it went back to normal and it is soft and gorgeous like before, but unfortunately, that’s only temporary. Washing your hair with the right shampoo and the right way will definitely keep it healthy and beautiful, as well as long lasting. Wash your hair whenever it feels like washing. Do it once in a week during winters and every day during summers. If you shower every day, try skipping the shampoo every once in a while otherwise it would result into a dry scalp. Gently work your fingers through the hair, don’t scrub it. This will prevent breakage and damage. Hot showers are fantastic, but not for your hair. The hotness dries out your skin and scalp. Rinse your hair with the lukewarm or cold water. Pouring too much shampoo will rinse out all the products. So only use the required quantity. A coin size would be enough. Your hair is fragile when it is wet, so pat your hair dry gently, instead of rubbing it with a towel. Don’t shampoo your scalp down always. Every once in a while begin with the nape of your neck. 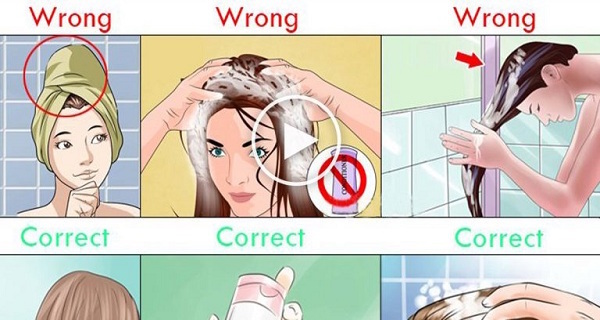 Before you apply the shampoo, you must be sure that your hair is completely soaked. Shampoo your roots and condition your ends!